Since the beginning of time, farmers have needed containers to carry and store garden products and the womenfolk required containers to organize their households. Many different types of containers existed to chose from, but in New England in the late 18th and early 19th Century, wood-splint baskets were the favored choice of many families. These baskets were very practical in style and generally referred to as field baskets or work baskets. The skills required for weaving containers from plant materials have been around almost as long as man. When Europeans came to America they brought their weaving skills with them. Most colonial families had a basic knowledge of basket making and were capable of making the simple baskets they needed in the field and household. 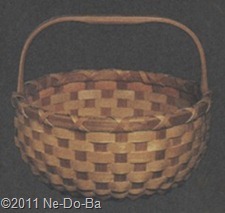 But only a few had the knowledge and skills needed to create wood-splint baskets. Shaker Communities have produced some of the finest wood-splint baskets known. They brought some of their skills with them from Europe in the 1700s and adapted other skills learned from the local Natives. By the early 1800s they were producing surplus baskets for resale. The German and Dutch that settled in New York state brought basket making skills with them to America and a few became well known in their local areas. A group of families known as “Bushwhackers” settled along the Hudson River and have recently been acknowledged as superior basket makers over a number of generations. Most non-Native basket makers were farmers first, so you seldom see “basket maker” listed as an occupation in census for non-Native families. Basket making was usually a winter activity that helped pass the long winter days. If your baskets were well made you acquired a reputation and your surplus could be traded with the local merchants or neighbors for needed supplies. Many professional basket makers were itinerant peddlers. They built up a supply of baskets from their home then traveled around the countryside selling or trading with rural farmers. They frequently caned chair backs and bottoms and offered other similar skills to supplement their income. It was a hard life and generally not a prosperous one. Regardless of your skin color, there was usually only a meager living to be made from making and selling baskets. Native basket makers were usually itinerants. They built up their inventories in traditional Native communities during bad weather months and traveled the rest of the year selling their goods. 19th Century newspapers and local histories are full of brief mentions of a family band camping for a couple weeks at a time to sell baskets and replenish inventories. These traveling family bands often provided some sort of entertainment to entice the locals to visit their encampment and purchase their products. Visit the Ne-Do-Ba website to see a wonderful sketch of an Abenaki Encampment about 1855 and discover more about known historical Wabanaki basket makers. After the Civil War a “fancy basket” market grew rapidly as specialty baskets gained in popularity with Victorian America. Baskets started taking on sizes, shapes, and purposes unimagined by early artisans. Much more of the weaving was done by women and more often the basket was sold for cash to a member of the new and growing tourist industry. Fancy work is most often attributed to Native Americans or the Shaker Communities of New England. Of course folks still needed work baskets during the last half of the 19th Century but their options increased as manufacturing processes developed. Still, you could find the occasional professional “Yankee” basket maker, such as Albra Lord (1836-1933) of Lovell, ME, with a reputation that went beyond his own community. You certainly don’t learn the skill of basket making overnight. Yes, today I can take a class and weave a basket in half a day, but that is just a small part of the real process of basket making. In the 19th Century a person could not go to the store to buy ready made materials and how-to books. A basket maker needed to learn what kind of tree to use, what characteristics made a good basket tree, and where to find these trees. Next, they needed to locate a supply of good trees, cut some down, and carry them out of the swamp (swamps are where most good basket trees are found!). The next step required a strong back and accurate aim as they pounded the basket tree into basket splints. This is definitely men’s work, taught by men to other men. If the needed skills to identify good trees were not properly learned and the work not done well up to this point, the basket would be of poor quality no matter how skilled the weaver. 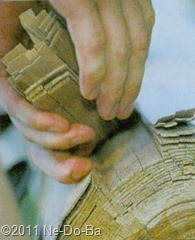 Once the splints were smoothed and gauged to the various sizes needed, the actual work of weaving a basket could begin. Both men and women performed this last step of the process in non-Native communities. In Native communities the weaving was most often done by women. “Fancy Baskets” were almost always made by women in both Native and non-Native communities, but there are always exceptions. Edward Jr’s occupation is never listed as basket maker in census records. I would not even know he was a basket maker if his son had not mentioned it in the letter published in the Annis Genealogy. Since he did specifically mention it, this suggests it was something the family was proud of, his finished products were worthy of notice by others, and valued by neighbors. Joseph is clearly described in the 1850 census in Vermont and the 1870 census in Wisconsin as a basket maker. In 1860 he was a farmer recently relocated to Wisconsin. His census entries suggest basket making was usually his primary occupation and farming was secondary. Joseph certainly learned the craft while growing up in his father’s household. In order to make a living at basket making, his work must have been of a high quality and valued by his neighbors. On page 473 of the Marden Genealogy discussed in this post, Ms. Getchell makes the following comment about Edward Jr. and the basket making tradition in his family. If Edward Mardin’s [senior] 3d wife was an Indian it seems logical that basket weaving as a craft would be known in the family. This really doesn’t make sense to me. She seems to be suggesting Chloe Barnes was the Indian wife of Edward Senior. But Chloe did not marry Edward until 1831. Edward Jr. was a grown man with a family and living in Albany, Vermont by 1830. When would Junior have time to visit his new step-mother in Lyman, NH often enough to learn wood-splint basket-making from her? The closest Shaker Communities were at Enfield, NH (established in 1793) and Canterbury, NH (established in 1792). Neither of these communities are very close to Lyman, where Edward Jr. grew up, so it is not likely he learned his skills from the Shakers. Most basket makers learned their skills from other family members while growing up. The person who taught Edward, Jr. to make baskets was someone he spent a good amount of time with. Whether or not his mother was Native, he most likely learned his skills from his own family or a close neighbor while he was young. No one has come forward with any surviving baskets (or pictures with baskets in them) made by Edward or Joseph and I do not have any documents that describe what kind of baskets they made. Based on the time periods and locations, I must assume (something a hate to do, but sometimes it’s all I can do) they made work baskets to sell or trade with neighbors. I should look for surviving merchant ledgers in and around Albany, VT where Edward lived and around Randolph, VT and in Wisconsin where Joseph lived. Shop ledgers may show entries for purchasing baskets from Edward or Joseph. If I am really lucky, an entry might even describe the basket (i.e. egg basket, bushel basket, laundry basket, etc.) and it’s value. If time and travel was not an issue, I would locate surviving local newspapers (already checked for them online!) from the time period and search for any mention of the family, baskets, or basket makers in the region. At this time, I simply do not have enough data to determine if the Marden family basket making tradition is Native or Yankee in origins. NativeTech Nipmuc Splint Basketry – article, pictures, etc. A wonderful article from a great writer ! If any of my readers use Diigo, you might be interested in my (the account is in my name, Nancy Lecompte) “Basketry in New England” list. I have not figured out how to provide a link to that list yet, but if you can’t find it let me know and I will study on it some more. Your blog is helping with 19th century research as to what types of baskets would have been used by citizens during the mid 19th century, especially for us who hail from New England. The additional information contained in your article will also aide in talks when the public visits the Civil War encampment and the subject of baskets is covered. Thank you for sharing your research and love of baskets which are articles of needful utility. Thank you very much for your comments. It is always nice to know my work is appreciated. Nancy, Over the years I have done a lot of Beedy/Beede family research. I just moved and my work is in disarray BUT I did want to give you a heads up that I found Moultons in the Tamworth/Sandwich area of NH. In the late 1700's my people moved from this area to Vt, NY, Canada and Phillips /#6 Plantation in Maine . In the Phillips Me. area I'm sure there are at least 2 generations of Mardens. One of whom married into the Beedy line. The name Chapin Marden stands out in my mind. Good luck. Barbara Beedy……Turner, Me.